Dulce de Mebrillo | A sweet quince. A sweet guest post. This is a guest post scheduled to publish while I’m off on my excellent adventure of traveling in Iran. By Maria Dernikos, one of my favorite bloggers. If you missed Maria’s glorious kooloocheh recipe post, you should totally check it out and if you are not already reading Maria’s blog, you really must remedy the situation post haste. Maria displays refined tastes, understated penache, and a gentile and utterly sweet charm in every post. Her recipes are great and her stories “sit in the heart” which is a literal translation of “del neshin” a word we use in Persian, which is most apt. 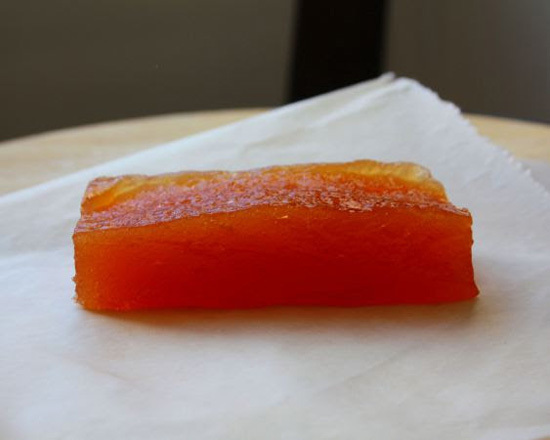 The guest recipe is for dulce de membrillo, a delectable sweet made with quince. Fond as I am of quinces and partial as I am to sweets, this is a recipe that I personally found alluring and am confident that you will find the same. Enjoy! 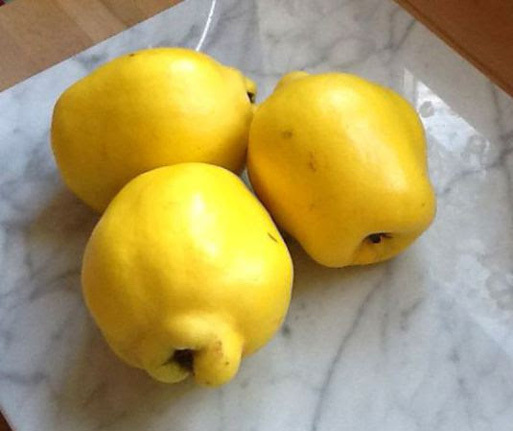 Quinces are hard to miss; they resemble giant yellow pears and have the most wonderful delicate scent. Inside their flesh is crisp almost hard which when cut discolours very quickly. This and their tart taste can be forgiven as that same tricky flesh turns into the most beautiful pinky red colour when cooked. This is a fruit so rarely seen in supermarkets and shops yet it has so much going for it. Full of pectin, these fruits are fabulous in jellies and jams. On top of which they are very versatile and can be used in sweet and savoury dishes. Quince is often used with meat dishes. Unlike other fruit it only takes three quinces to produce something truly delicious. Quinces and quince trees seem to be hard to find and A Taste of Wintergreen posted a link which sums up the problem in a really interesting article found here. All you need are: quinces, sugar, and water. Weigh the quince pulp and whatever the weight add an equal amount of sugar. Place in a clean pan and return to a gentle heat. Now the patience starts as the the sugar and pulp need to be stirred otherwise they will catch on the bottom of the pan and burn. Keep doing this until the mixture becomes thick and you can see the bottom of the pan when you drag the spoon through it. Beware of spitting because the mixture can become too hot and will spit. Using a long handled wooden spoon helps to avoid this. Transfer to a dish lined with greaseproof paper and allow to cool. When cool remove from dish, wrap with fresh greaseproof paper and store in the fridge. Spread on bread or crackers. For heightened, exquisite pleasure, serve with cheese. Eat it. Enjoy it. And as they say in Greece: καλή όρεξη – Kali orexi! Thank you for a lovely guest post, dear Maria! And you guys, don’t forget to keep in touch with me while I’m away via Facebook and Twitter. or Instagram. Miss you and I’m waiving hello as I munch on a koloocheh all the way from Iran! Hope every is fine and you are having lots of fun! What a gorgeous color! I wish I had more access to quinces, this would be heaven in the morning on some fresh bread! Are you back? I LOVED reading your posts while you were in Iran. Yeah! Blue cheese and quince paste! Do they make tea with quince marmalade there too? Very happy to have discovered your blog. Cheers.